Lastly…When Will the OSV Ratings Be Officially Released? 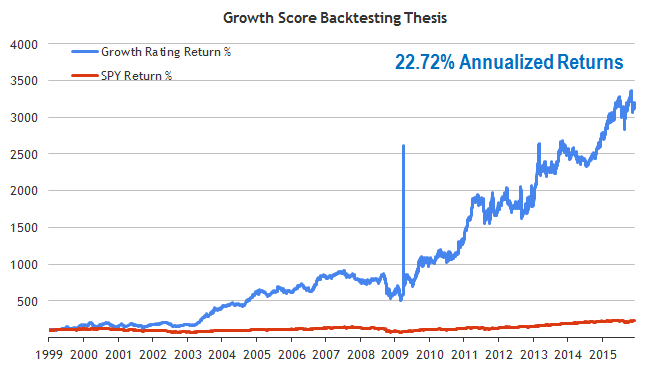 The backtests for this Growth Score show that it’s another winner at 15.3%. Previously I showed the Quality Score generating 16.8% and the Value Score achieving 16.7%. Creating the Growth rating was harder than I thought as I don’t have much of a typical “growth” mindset. My interpretation and focus on growth has to do with the qualitative side. what other industries or creative ways is the company executing to grow? is the industry large enough to accommodate more growth by the company? is the industry also growing or shrinking? I look for stocks that are solid fundamentally and in a position to grow. I don’t search for stocks based on how much revenue, earnings or other numbers have grown over the past years. Relative strength and other technical indicators are beyond me also. That’s the approach I took here as well. Rather than search for high flyers, what the Growth Rating really represents are stocks with positive growth who are growing by utilizing their assets well. I’m going to share the full details with you. Just don’t focus too much on the 15.3% returns. The 15.3% returns from the backtest is just theoretical proof that this works on paper. In other words, the strategy itself is a winner. But what I really want to show is how and why this works. First the numbers on a yearly basis. As I pointed out in the quality score, I focused on reducing drawdown as much as possible. Drawdowns are a huge problem with mechanical strategies and since you end up buying stocks you don’t know, it’s easy to give up. And since I create tests and strategies based on 1 year holding periods, the drawdowns are larger than trading systems where you buy and sell about 20 stocks a day. As much as I don’t like drawdowns, I also don’t believe in frequent trading as it eats away your portfolio with fees as you end up playing the same game as the traders. They will out trade you with their eyes closed. Now, there are really 3 bad years here where the Growth Rating seriously underperformed. 2007, 2008 and 2014 where 2008 was horrific with a -44% decline. That’s close to half of a portfolio being wiped out. 2009 more than made up for it, but 2008 is enough to make anyone puke. However, when coupled with Q and V, the final combined Action Score performed marvelously well in 2008. That’s the power of combining Q, V and G all together. But I’ll be talking about the Action Score in another post. I kept the max number of criteria to 4. The more filters a stock has to pass, the bigger the drop in performance. Just because stocks can pass a 8 point checklist, it doesn’t mean it’s a buy. It could be the total opposite where you are too strict and end up only allowing mediocre upside stocks to pass through. Here’s the initial backtest I performed that proved I was onto something. This is a 20 stock portfolio backtest. After eliminating OTC stocks, financials, energy, mining and utilities, the results continue the outperformance. Based on this data, I’m really excited because the combination of metrics I’m using is validated and it’s not a borderline combination. The ugly spike in the first backtest is gone. Most likely from a OTC stock that exploded temporarily and crashed back down. The goal here is to look for stocks that actually grew. I’m not interested in high flyers and wall street darlings. I’m really looking for growth stocks with a strong value flavor. Same thing as above. I don’t want companies that are perennial losers for 5 years or more. This ratio deserves an article of its own. In this case though, it has the biggest positive effect on the results. Comparing gross profit to assets tells you whether or not the assets are profitable. In other words, GPA measures the growth of profitability. When I look for stocks with a GPA above 1, I’m saying that I want stocks that are generating more than a dollar for every $1 of asset. A GPA of 0.5 means the company is generating profits of $0.50 for every dollar of assets. You can see how this is also a great way to compare competitors within the same industry. I include the F score for quality and value. Best way to filter out horrific stocks so that it doesn’t cloud the results. I have to repeat this because I get this question about the results often. Since my goal is building a rating system where every stock is scored and ranked, it’s very different to a screener. A screener is to simply get stocks that pass specific numbers. A rating system may have stocks at the top of the list that fail certain criterias. That’s why each variable is weighted in the final formula. Stocks outside of the ideal ranges are penalized. You’ll see what I mean in the list of 2015 stocks below. If you look at the GPA column, only 4 stocks meet the criteria of being 1 or above. That’s what I meant by a rating system being different to a screener. 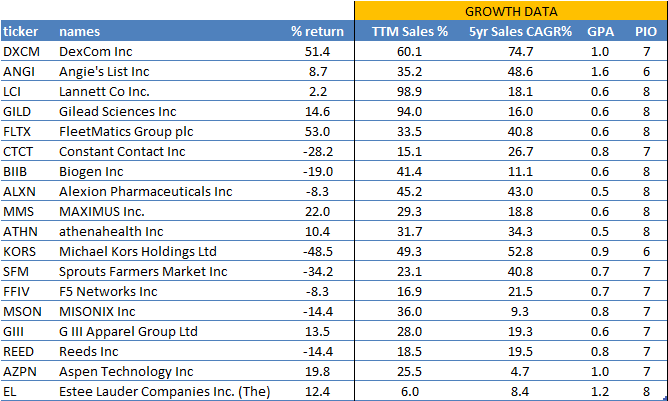 If you bought these 20 stocks at the beginning of the year, you’d be looking at a price return of 1%. Sure I’d love to have shown you the growth stocks exploding and defying the struggles of 2015, but the final Action Score is so much better and you’ll be amazed at the results. Watch out the for the final part of how the OSV Ratings have been created. This rating system is being developed and the tentative release date is 2016 Q1 for existing members. The screener will be coming later simply due to the sheer size of the current development that my team and I are going through. For the first phase beta, the idea is to have all current members grandfathered into their plan and open it up to a small number of people to test it out. The spreadsheet analyzer will continue to operate as usual, but you’ll also gain access to the online version when complete. So if you want to be one of the first and grandfather your rate for life, sign up to old school value and start reaping the benefits of how much time and headache you’ll save. I get a lot of people who sign up and cancel because they believe they can probably save a few bucks and do it on their own. However, they come back shortly after because they understand how much time is sunk with trying to build and manage and update their own models each quarter. The free value stock screeners will remain available to everyone but the ratings will be only within the web app itself.